MAGALDI operates according to high ethical and quality standards. 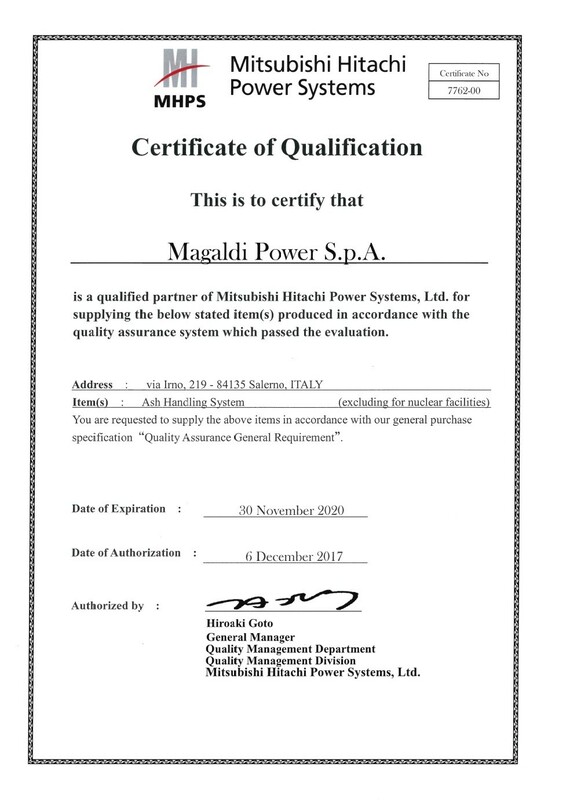 Working in a global market, with the best available technology, has driven us to pursue the continuous improvement of the systems we supply for handling bulk materials, overcoming the expectations of even the most demanding Clients who consider Magaldi not just a supplier but also a reliable partner. Since 22nd August 2013, Magaldi has adopted a Quality Management System certified UNI EN ISO 9001:2008, in order to reach the full satisfaction of the Client needs. 2) UNI EN 1090 - Execution of steel structures. Furthermore, as the respect for the Environment, Health and Safety of its employees is considered a priority, Magaldi is also developing an Environmental Management System complying with UNI EN ISO 14001:2004 and a Safety Management System conforming to OHSAS 18001.